Home Workouts 3 Reasons Why Push Ups Are Good For You! 3 Reasons Why Push Ups Are Good For You! If you are curious as to why push ups are good for you then technically I could almost write a book telling you why they are, but for the sake of this article lets discuss the 3 major reasons why. Check out the 3 benefits I have laid out before you below and hopefully you’ll start to engage in this tremendous body weight drill yourself. Benefits Of The Push Up Exercise! 1. Muscular Strength: You may have thought that this one could go without saying, but its very true. You can absolutely get stronger from doing push ups because you are having to manage most of your own body resistance which isn’t easy to do. As a strength and conditioning professional I often laugh at people when I hear them say push ups are easy, yet no one likes doing them. 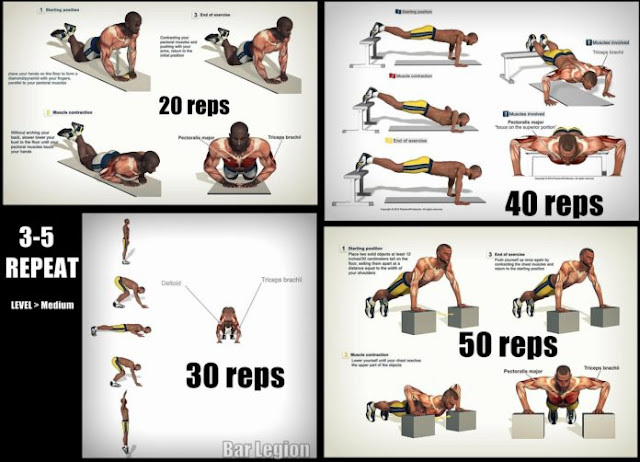 If this exercise is so “easy” then why don’t people just drop down and crank out 40 or 50 at the end of their work out. Another factor is that there are many ways to do push ups in order to make them even more of a challenge by manipulating your weight distribution. Push ups are great for strength. 2. Conditioning: Push ups are great for conditioning in both your cardiovascular and muscular fitness. If you are able to do 10 to 20 of these with a moderate level of exertion then you know that this will both get your heart rate going and pump your muscles full of blood. Either way you are getting a significant level of overall conditioning. This also helps to cut body fat too! 3. They Are Better Than Crunches: I decided to throw this 3rd reason in as a sort of formality because everyone is so hung up on the by product of exercise which is “looking good.” The fact is that if you train right the cosmetic benefits will be there, nonetheless push ups are great for bringing out your abs. This is true because of the previous 2 reasons I mentioned in addition to the fact that there are many more muscles that make up your core than just your abs. You see when having to stabilize your body whether using your own body weight or some additional load of resistance you are working many of your core muscles including your abs to pull the exercise off. If you imagine doing a push up correctly your body should be straight and rigid. This rigidity is caused by you stabilizing your spine and midsection with your rectus abdominus, obliques, transverse abdominus, erector spinae, glutes etc.. These are your core muscles. If you were wondering why push ups are good for you well then you just found at least 3 good reasons why. Take the time to learn more by accessing more of my articles on the subject for free. Remember that most anyone can train hard, but only the best train smart!